I`ve already mentioned that I love eating apple desserts, so it was only naturally that apple pie cookies would intrigued me. When I spotted this recipe on Annie Eats, I immediately set out to buy apples to make these! However, I didn`t have round cookie cutters (I need to get me some! ), but I did have heart cookie cutters (knowing me, of course I would *hintatmyblogname*)! I`m still not ready to tackle making my own pie dough, so I used frozen pie dough to make these. I used 2 medium size granny smith apples and two pie dough. Since, I followed Annie`s steps exactly, I`ll link you to her beautiful site! (No, I`m not lazy/too busy to write it down...I followed her recipe, thus, it is only right to link!) I will mention some of the things I did though, in case you guys were wondering... instead of cutting the apples into rings, I sliced the apples into small pieces So they would fit into the heart shape dough (you can see this in the first picture). I managed to make a few circle ones, using a small bowl. LOL. It was awesome. My roommate LOVED these, she ate most of them! LOL. If I were to make these again, I would definitely add more apple slices, since I felt that they didn`t have enough apples in them. 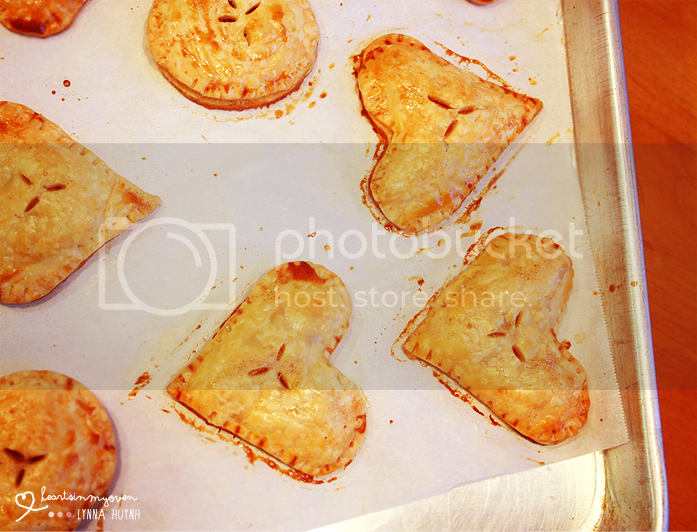 My roommate loved the ratio of apples to pie crust though, so...it`s all preferences! Anyways, these would be super cute and simple to make for a potluck and totally share-able if you want to share with friends, family members, neighbors, coworkers, etc! Lynna, these cookies are so cute! Love that you used pie crust and fresh apples to make them. Great job! Also - I post on Mondays, and I think most bloggers do, because I go the whole weekend without posting and it's good to start fresh right away on Mondays! thank you! :D & ahh, i assumed that was the reason! OMG how adorable! 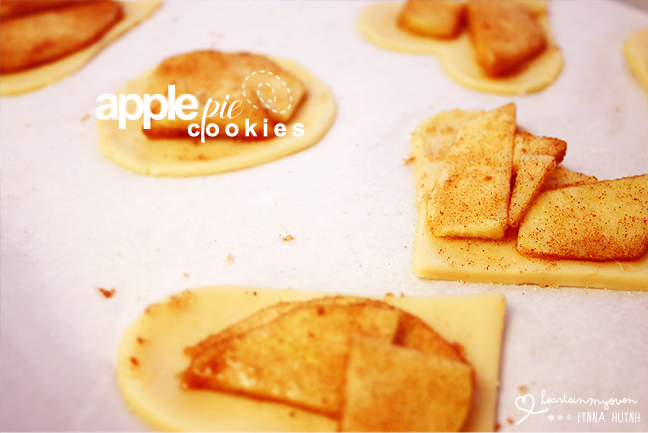 Apple pie never gets old - everyone always wants a piece (or a cookie). woah - woah!!!! this is so cute and adorable. ahah thank you so muchh!! Great post. I was wondering if you would like to put up a link to this apple recipe in my Food on Friday Series. Thanks for linking in - I have put the recipe name in for you.